I’ve been thinking about how to write this blog for a while and on yesterday’s run, I had a lot of time to think about putting the words down on paper. So, here they are. Although I had always taken part in sport as a child, and by sport I mean weekly dance lessons – which my own husband says were definitely a waste of time – and first reserve for any school teams, I was never a runner. I vividly remember the pain caused by running 800 or 1500m, feeling like my whole body was exhausted and my legs burned. I decided running was not for me. But I kept being drawn back to it. My first attempt at running was a bit of a disaster. At University, I took part in my first half marathon. I remember thinking it would be fun and some friends were doing it too. I had done very little training, I ran / walked most of it, stopped at McDonalds as it was on the route and some friends were there, chatted to more friends and remember finishing and hanging up my running trainers as this was not something I ever fancied doing again. My second attempt could have not gone much worse. I started running using the couch to 5km app when my second daughter was just one. I thought it would be a good way to get rid of the baby weight that had been loitering since baby number one. I remember ticking off the weeks beautifully with big milestones passed successfully. 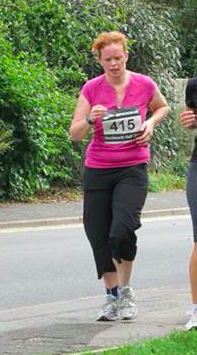 Running for seven minutes is one I remember clearly. I recall in one of the final weeks a solid 20 minutes running, which I did and I was so proud on my return home with my achievements. However, the next day my ankle throbbed. I hadn’t fallen over so I didn’t think I could have done much to it, so I carried on as normal and on my next run day I tried to run again as I didn’t want to stop as I had got so far. I had to stop because the pain was just too much. After two weeks of pain and two trips to the doctors, a trip to the x-ray department revealed that I did in fact have a stress fracture from that 20-minute run and I then spent the next six weeks in plaster. with two small children, I fully committed and enjoyed just completing my first full marathon in Brighton 2014. This new found love of longer distances has led me to complete many road marathons, including London, and trail marathons. 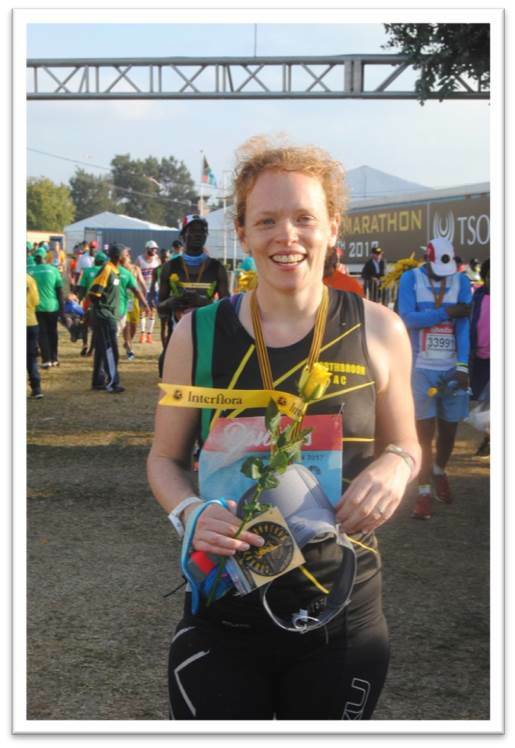 In 2017, I entered and completed Comrades marathon, a 86km road race up hill in South Africa. Since then, I may have ran longer distances and completed amazing challenges but still getting my shoes on and getting out the door is a massive achievement. There are still days, when an ‘easy’ 5km run is not that easy and I want to give up by the end of the road. There are days when I doubt that I can get round my planned route. I now know that the lure of cake at the next food station or at the end of a run is what keeps me putting one foot in front of the other! Plus friends. I love running with friends, whether it’s those who I start a run with or make on the way round. Running has brought so many wonderful things to my life and at times I get a bit evangelical about how amazing it is. Running is definitely the best thing. All runs are all achievements and it is great (and right) that they are all celebrated – especially with cake and among friends!